Life in Nagaland is replete with festivities throughout the year as all the tribes have their own festivals, which they greatly cherish. They regard their festivals sacrosanct and participation in them is compulsory. They celebrate their distance seasonal festivals with pageantry, colour, music and fanfare. Most of these festivals revolve round agriculture, which is still the mainstay of Naga society. Over 85% population of Nagaland is directly dependent on agriculture. Naga inhabits the wild, wide open pastoral countryside. In this blissful setting Nagas savour nature’s bounties with a rare gusto, filling the onlookers with awe and admiration. 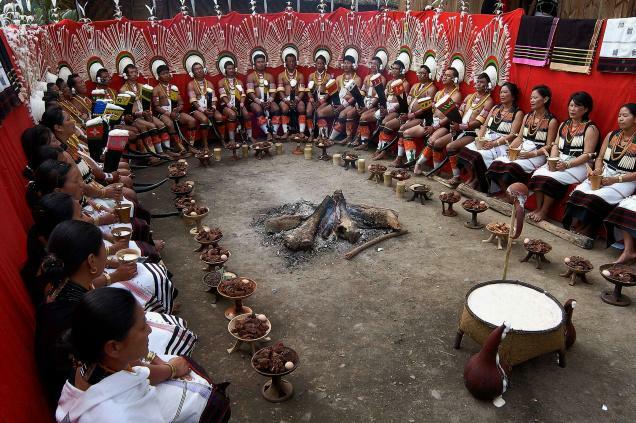 Although some religious and spiritual sentiments are inter-woven into secular rites and rituals, the predominant theme of the festivals is offering of prayers to a Supreme Being hailed by different names in diverse Naga dialects. At these festivals, the spirits and gods are propitiated with sacrifices by the village Shaman (priest) for a bountiful harvest either before the sowing or before reaping the harvest. Stretched over six days, the Aoling Monyu Festival provides an excellent insight into the rich culture heritage of the Konyarks tribe. With the completion of the showing season by March-end, the festival marks the end of winter of the old year and heralds the New Year beginning with spring. The Sangtams celebrate Amongmong in the first week of September when the new crops is ready for harvesting. The main feature of the festival is the worship of the God of the house and three cooking stones in the fireplace. 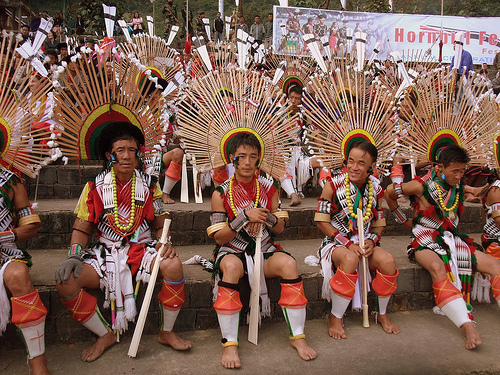 The Hornbill Festival is celebrated every year at Kohima from the first to seventh of December. This festival is organized by the State Tourism and Art & Culture Departments. 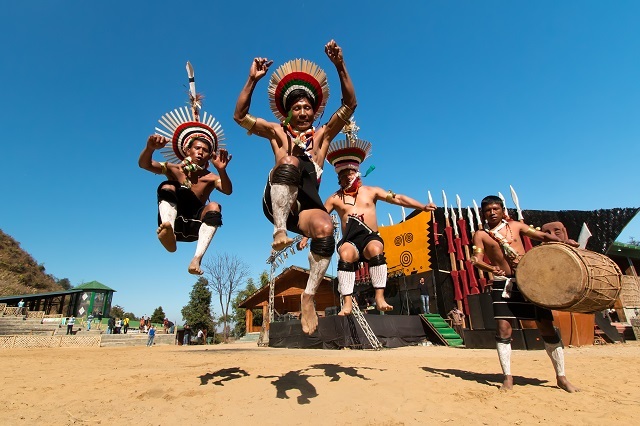 Hornbill Festival is held at Naga Heritage Village, Kisama which is about 12 km from Kohima. All Naga people have to take part in this festival. The Yimchungers celebrate the Metemmeo festival after the millet crop is harvested. But the festival is also connected with praying for the souls of the departed. Young girls and boys also get engaged during this festival, which is spread over five days. With its strong agricultural implements are worshipped. The Aos observe Moatsu after the sowing is done. Stretching over a period of six days, the festival is marked by vigorous merry-making after the hard labour of jhum farming. 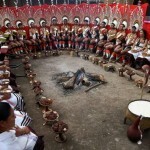 Moatsu Festival is celebrated by the Ao tribe of Nagaland. Moatsu festival celebrated in the first week of May every year. Monyu is celebrated by the Phoms after the showing of paddy every year, from the first to third of April. Nagda is an annual celebration of the Rwengma Nagas observed towards the end of November / December. It is a popular belief of the ancient Rwengmas that the spirits of the dead visit their graves and the home of their relatives once every year. Particularly during this festival. The strong hardy and handsome change Nagas celebrates Naknyulum during the first week of July for the period of six days. No marriage ceremonies are performed during the festival. The change decorates their houses with aspecial kind of tree the Ngunam. The Angami tribals celebrated Sekrenyi in the month of February. It normally falls on the 25th day of the Angami month of Kezei. The 10-day festival is also called Phousanyi by the Angamis. The Toskum, a festival of the Khiamgans , is associated with harvesting which takes place in October. Tuluni Festival held in the month of July. Tuluni Festival is the most important festival of the Semas. Nobody is allowed inside the village on the first day of this 5-day festival. The forth day is the day of prayers and offerings to Litsaba – the deity of fruitfulness who gives life and protection to the crops. 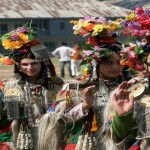 Nazu tribal festival held in the month of February. 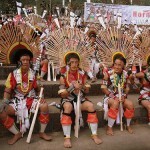 Nazu tribal festival is one of the most famous merry making festivals of the Pochury tribe of Nagaland. This gala event is celebrated for 10 days prior to the sowing of seeds for the year. Yemshe Harvest festival held in the first week of October. 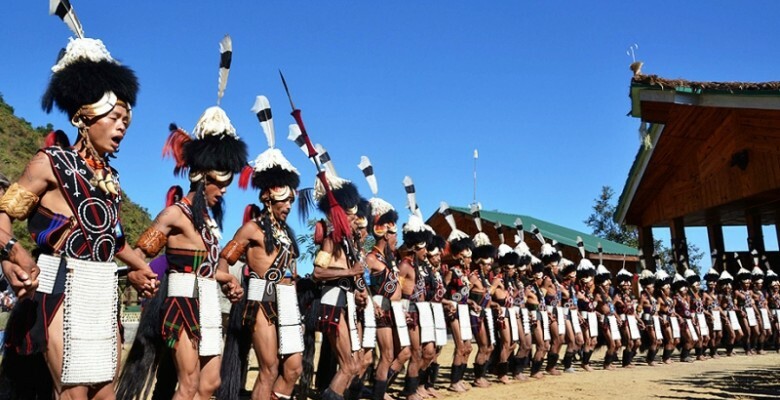 This festival is celebrated by the Pochury Tribe of Nagaland. During this festival the arrival of the new harvest is celebrated with full fun & fair. This entry was posted in Festivals & Fairs, Nagaland, Nagaland Fair & Festival and tagged Fair, Fair & Festival, Festival, indian festival list, indian festivals list, list of indian festival, list of indian festivals. Bookmark the permalink.